The public housing project the Farragut Houses in Brooklyn, New York. 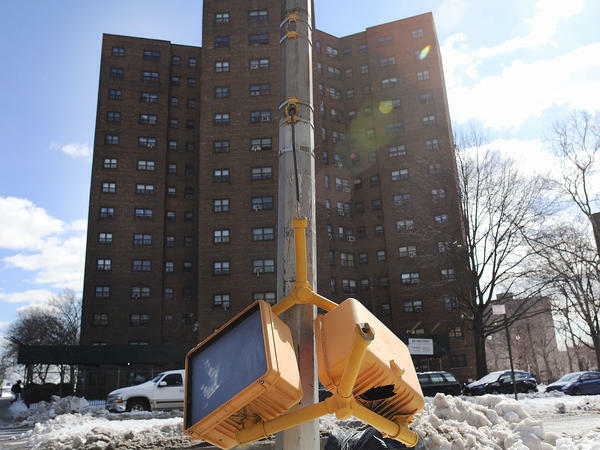 The budget blueprint President Donald Trump released Thursday calls for the cutting of billions of dollars in funding from the Department of Housing and Urban Development. The White House's Fiscal Year 2019 budget proposal, released Monday, calls for work requirements for those who receive public housing subsidies and slashes funding for the Department of Housing and Urban Development by $8.8 billion. The budget outline also zeroes out the Public Housing Capital Fund, dedicated to rehabilitating and modernizing public housing developments, and eliminates the Community Development Block Grant which local governments can use at their discretion to address a variety of community and infrastructure needs. In a tweet, HUD Secretary Ben Carson pointed to a goal of "self-sufficiency." The budget underscores the administration's push for Congress to pass legislation to add work requirements to "require able-bodied individuals to shoulder more of their housing costs and provide an incentive to increase their earnings." It also wants "greater private sector involvement" to finance the revitalization of housing units. The White House budget is non-binding but carries weight as a statement of the president's spending priorities. Just last week, Congress passed a two-year spending pact which Trump signed into law. In a budget addendum crafted after the bill's passage, the administration added $2 billion to its request for HUD. But even that addition would leave HUD's funding well below current spending levels. The Trump administration's document calls for a 14.2 percent decrease from current levels, including cuts to to various rental assistance programs like the federal housing subsidy known as Section 8. The reason, according to the budget document, is "to address the increasing and unsustainable Federal costs of rental assistance." "This is a harsh budget for housing programs that help low income families keep a roof over their head," said Will Fischer, a senior policy analyst at the Center on Budget and Policy Priorities. HUD provides housing subsidies to about 4.7 million "very low income households," according to the the administration. Such subsidies make up about 80 percent of HUD's total budget. The administration's changes exempt the elderly and the disabled. According to the Center on Budget and Policy Priorities, almost 90 percent of the households that "receive rental assistance through the Department of Housing and Urban Development (HUD) are elderly, disabled, working (or worked recently)." Current rules require tenants receiving subsidies to pay at least 30 percent of their income on housing after deducting certain expenses such as medical and child care payments. The Trump administration does away with those deductions and additionally calls to raise the floor to 35 percent "for all work-able households." The elderly and disabled would be exempted from these increases, as they are currently. "His budget would mean more than 200,000 seniors, families, and people with disabilities could lose their rental assistance that they get today, putting them at immediate risk of evictions and potentially homelessness," Yentel said.